I was chosen by 5 time Emmy award winning celebrity makeup artist, Eve Pearl to help launch her cosmetic line here in Canada. On March 27th, I was an Eve Pearl Makeup Artist/Model on the Toronto Shopping Channel! There was 4 shows in total that day. I was completely over the moon for this opportunity. Not only is Eve Pearl the Makeup Goddess but she is one of my my makeup idols. I am so blessed to have this opportunity to work with/for Eve herself (a women I completely admire and respect in this industry). I'm thanking my lucky stars! This was a dream come true. I'm looking forward to adding to this post because she has asked me back for her next show in May. It felt so great to help out with a cosmetic line that I'm in love with and believe in! I truly stand beside and behind it, 100%! Her products are the core of my professional & personal MU kit. Not only did Eve encourage me, teach me, and motivate me, but she also let me in on a secret. 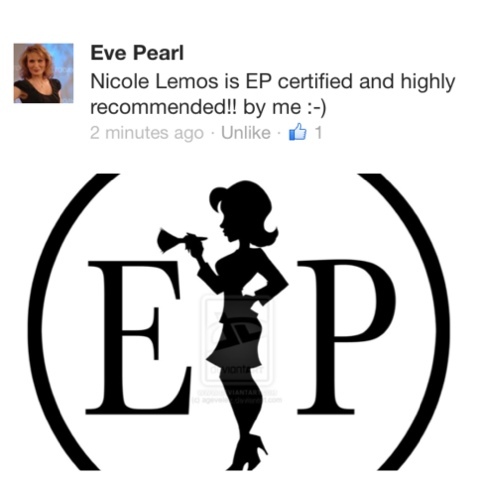 Let's just say that I'm in on the inside track of Eve Pearl's new product line that's in the works of being launch! Think of the fierce side of Eve... Her alter ego! I can't wait for you all to see and to get my hands on it! This is a true before and after shot from our day at the shopping Channel. This is only using the HD Dual Foundation!!! Incredible, right! Here is Eve & I. She is about to demonstrate her Blush Trio and her Fan brush! Go HD, Go Eve Pearl! Take advantage of the Eve Pearl promo on the Shopping channel, Click Here. Check out the Eve Pearl Web site for more product information, Click Here.